I t is challenging to overcome the intense public speaking anxiety (PSA) that many experience. As I discussed in my last post, PSA can affect your cognition, behaviour and physiology in different ways. In this and upcoming posts, I propose a PSA toolbox of strategies to help you manage your PSA responses and become effective public speakers. In the first of this series, I will discuss how adjusting your body language through power-posing can help you deal with stressful events. Body language is an integral part of presenting, communicating and interacting with others in everyday life, and public speaking is no exception. Your audience members view your slides, listen to your voice and see you. They see your movements, gestures and attitude, and they “make sweeping judgements and inferences based on body language, and those judgments can predict really meaningful life outcomes.” You cannot stop your audience from seeing you, short of becoming invisible, and you can’t stop them from judging you – even if you are invisible! But you can potentially change the kinds of judgements your audience makes by engaging in preparatory non-verbal displays of power or powerlessness. In nature, animals, including humans, display power or powerlessness through non-verbal displays. For example, to entice a mate or intimidate competition. Power is expressed and projected through expansive open postures and enlarging occupied space resulting in what researchers call “high-power poses”. 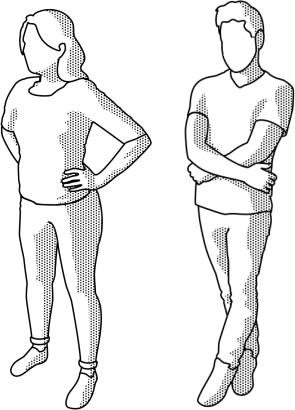 In contrast, powerlessness or “low-power poses” are expressed through the contraction of occupied space and closed postures (Figure 1). Studies show that whereas power itself generates non-verbal high-power poses, the reverse is also true – adopting non-verbal high-power poses can make you feel more powerful. In 2015 and 2010, researchers at Harvard University and Columbia University, respectively, showed that preparing for a stressful event, such as a mock job interview or gambling, by power posing (for 2-5 minutes) before the event affects both posers and evaluators during the event. The studies revealed that adopting power poses can cause “adaptive psychological, physiological and behavioural changes.” For example, high-power posers experience higher levels of testosterone (the dominance hormone), lower levels of cortisol (the stress hormone) and an “increase in feelings of power and tolerance for risk.” Low-power posers experience the opposite. Furthermore, preparatory power posing can affect a person’s performance, presence and outcomes in a stressful social evaluation such as a job interview. In the Harvard study both the audience/evaluator and the power posers themselves were influenced. For example, in the job interview, a high-power poser was judged favourably by evaluators in aspects such as confidence, presence, enthusiasm, composure, overall performance and hireability. In turn, when a poser enacts a behaviour that generates power, the poser actually feels more powerful psychologically, behaviourally, and physiologically. This change can positively affect real-life outcomes in stressful situations. This is the first tool in the tool-box. Keep in mind that these tools are not one-size-fits-all. Choose the tools that work best for you based on an understanding of how PSA affects you. You can then, develop a personal strategy to manage your responses and apply your strategy in real situations. And you may need to test and adjust your strategy as your speaking progresses. But why not try this tool out and see if it works for you? By engaging in power posing before a stressful event such as an interview or even a presentation, you could potentially counter PSA responses by elevating testosterone levels and also, importantly, lowering stress hormones. By reducing the negative effects of PSA you are more likely to communicate effectively and interact positively with your audience. You won’t have to worry about being embarrassed as you will be practising these poses in private. Preparatory posing is a simple action that can have significant impact. The exception being when you have your dating profile picture taken, where expansive postures of openness and dominance increase the initial chance of romantic success (Vacharkulksemsuka et al., PNAS, 2016).